I’m no longer holding a hostage. I went into labor early on Tuesday morning with intermittent contractions continuing all day at work. In the late afternoon, just when I thought I’d call the doctor, they stopped. Later in the evening they started up again and when I called my doctor, he said to come in. By the time Mabel and the dog were headed home with my dad and Mac and I got to the hospital around 10pm, contractions were 5 to 7 minutes apart. It quickly became clear this was the real deal. Unfortunately, after being early labor all day, and active labor for about seven and half hours at the hospital, I was not making any progress. Nemo was still not moving down. Given my previous C-section, the lack of progress, and the type of pain I was having, we made the decision was made to proceed with a C-section. 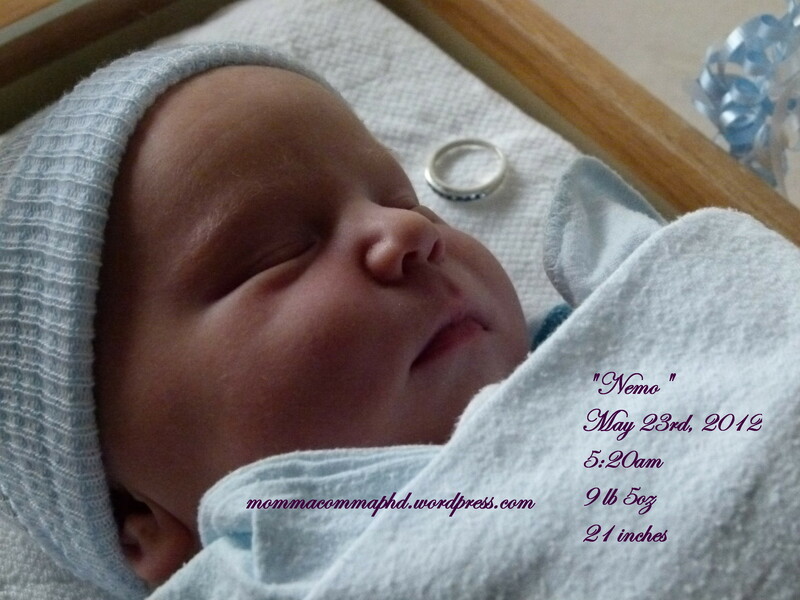 Nemo was born on Wednesday, May 23rd at 5:20 in the morning, at 41 weeks and 5 days gestation. While I really wish I hadn’t needed the surgery, the outcome is what I had hoped for: a safe delivery, a healthy baby. Just like with Mabel’s birth, Mac kept his poker face in place, no matter what the circumstance- like seeing my disembodied uterus. He was the only person I wanted with me and he was all the support I needed. While I am always grateful for him, the feeling is never more pronounced than when I’m at my most vulnerable and he keeps me feeling safe. So far the recovery has been much easier than after the C-section I had with Mabel. The way I’m feeling today, 10 days out from surgery, took several weeks after my previous C-section. I’m getting around well, I’m already off the prescription pain medicine, managing my pain with just ibuprofen. For that I am very grateful. The only complication I’ve experienced has nothing to do with the surgery- it’s late onset pregnancy-induced hypertension. While my blood pressure was fine the whole time I was in the hospital, since I got home, it’s become elevated. Nothing dangerous (yet, or hopefully ever), but high for me. So, there’s been extra visits with my doctor and doing my best to follow his recommendation to stick with bed rest. The doctor is not calling it late-onset pre-eclampsia, just hypertension, and said that most cases resolve within 8 weeks of delivery, but with bed rest it may resolve sooner. The bed rest has been really challenging for me, and I feel like such a burden on Mac. It’s like he has three beings depending on him for everything. Before Nemo arrived he was already doing the bulk of the housework and childcare. Now that I’m laid up, he’s doing even more- with a whole additional child to care for. I really hope that my blood pressure is improved at my next OB visit- which will be my 2 week postpartum visit, and my birthday. So I know what I will wish for when I blow out my candles. Nemo is doing great. From the start he’s nursed like a champ. At his first pediatrician’s appointment, he was 6 days old, and he’d already surpassed his birth weight (which the ped said they usually give babies up to 2 weeks to do). While he was a cranky pants today, he slept GREAT last night- 11pm to 4am, and again from 5:15am to 7:30am. I’m crossing my fingers it wasn’t a fluke! Mabel is also her usual self. 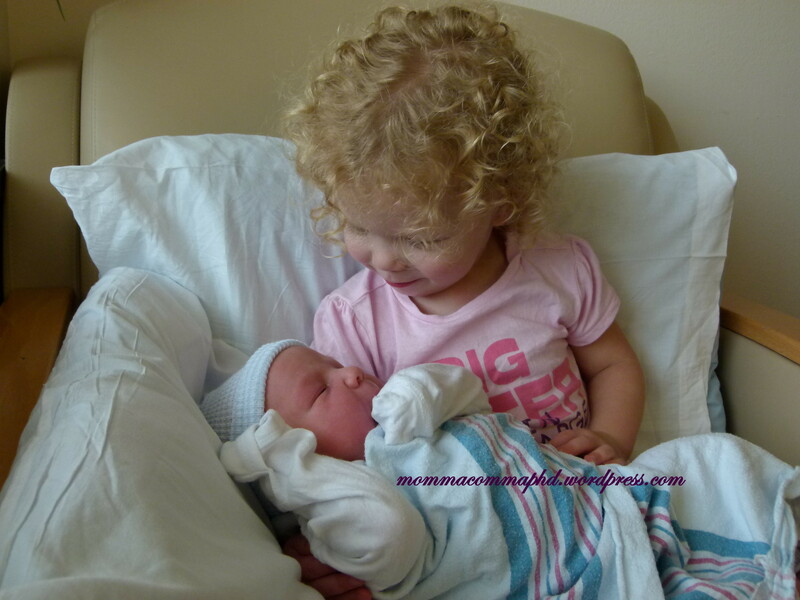 She loves her baby brother, is always eager to help out, etc. While we have seen some additional tantrums and she is having a little trouble with me being incapacitated and Mac’s attention being so split, she’s only two and this is nothing that was unexpected. Overall, she’s a wonderful kid and it’s great to see her growing and changing. I honestly think that the transition is harder for me than for her. I miss having tickle fights with her, snuggling her close, going for walks, and all the other stuff we normally do that I can’t right now because of the surgery and the bed rest. Mabel holding her baby brother for the first time. We were lucky that my in-laws were here until yesterday helping out- entertaining Mabel, making meals, etc. Now that we are alone, things are fine. We’re adjusting to life as a family of four!